Mobile app monetization is one of the most important factors to consider when developing a mobile app. After all, every developer’s end-goal is to generate revenue out of their app, not only to cover its costs but to make a profit as well. There are many ways to do so but one of the most popular and successful sources of revenue for apps are mobile in-app purchases. According to Statista, the total global revenue from in-app purchases projected for 2017 was nearly $37 billion, while the total global revenue generated from paid app downloads was only about $29 billion. This shows that in-app purchases are dominating the industry and they should be a main focus to consider in the app development process. Now you can’t just create in-app purchases in your app haphazardly and let it run itself. It’s a long process that requires blood, sweet, and tears. 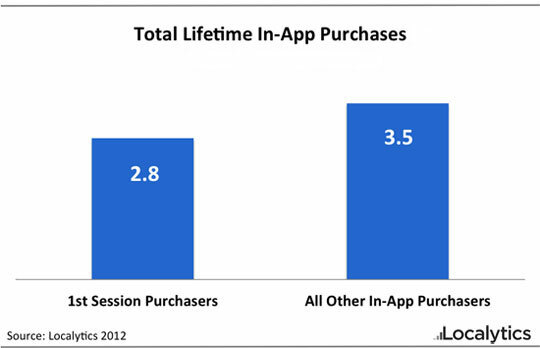 You need to optimize your in-app purchases to make sure that you’re getting the most that you can out of them. There are many different models, techniques, and strategies that the top-grossing apps and industry leaders use to optimize their in-app purchases and increase their revenue and we’ll be discussing all of the main and most popular ones. So without further ado, let’s get started. A lot of developers focus on developing the main idea of their app and don’t focus on the mobile in-app purchases and monetization aspect of the app until the end. I don’t need to tell you that this is wrong. You need to plan it all at the very beginning as you’re laying out the roadmap for your app and it should be a priority. Keep in mind that many aspects of your app will most likely depend on your mobile app monetization model you go with and the in-app purchases you create — a lot of features and app strategy will be built on them. So you have to include it as part of your planning in your early development stages to make sure everything works well together and complement each other. The very first thing is choosing the titles for your in-app purchases. You need your titles to be catchy, and something that would appeal to your users. Your titles don’t need to be an exact description of what the items are unless it makes sense for your app. However, they can be funny or punny so that they would stick with your users and encourage them to buy them. This is where you get to explain what each item is or what it offers. Just like titles, these don’t need to be an exact explanation of each item, and you can use it as an opportunity to tease the users or play around with them. Users usually appreciate things that make them laugh and little Easter eggs thrown around the apps. So think about that before choosing a direction and tone to go with depending on your app. Many studies in behavioral economics, neuroeconomics, and psychology have came up with multiple marketing words that appeal to consumers’ primal instincts and increase their chances of purchasing. Some of these words include: You, New, Free, Guaranteed, and many more. Make sure to incorporate these words and more showy flashy marketing words to help push your users even more to make that purchase. One strategy to help persuade your users to make an in-app purchase is offering customized and personalized items. For example, adding the user’s name to the item’s title or even in the design of the item itself, or even going one step further and letting the users customize the designs of their items. This helps make the item feel more personal to the user and consequently increase their chances of getting it. Possibly one of the oldest strategies in the book for mobile app monetization is offering your app for free but populating it with ads that are being served by an ad network. That way the user is happy for not paying for the app, and the developer is happy for making a revenue off of the ads. Now some people might not want their experience to be interrupted at any point by an ad or to be distracted by one. That’s why a lot of developers offer an option to “Remove the Ads” as a one-time in-app purchase that makes all of the ads disappear from the application for a small price that would work as a substitute from the revenue that was being made by the ads. That way you’re giving your users complete control and a choice — you have a monetization source but you’re also offering them an out. Consumable in-app purchases are items that are used once and then disappear and would have to be repurchased again (e.g. coins, power-ups, etc. ), while non-consumable items are purchased once and offer you an advantage or access to something forever (e.g. access to locked levels). 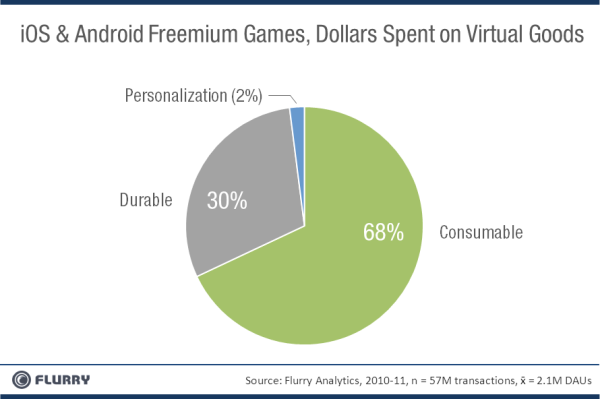 A study by Flurry analyzing a data set of over 57 million purchases across both the Android and iOS platforms has shown that consumable items contribute the most to the overall revenue compared to other kinds of in-app purchases. So you need to keep that in mind and offer consumable items in a way that fits your app. Humans are visual beings by nature, and it’s an aspect that you can leverage on to achieve your objectives. Your mobile app visual and UI/UX, in general, can greatly affect your users’ experience and consequently their satisfaction. It can have the power to completely turn off users from your app or compel them to stay and drive them to take actions through your mobile app. Make sure to create an in-app store, having a place dedicated solely to your in-app purchases, that is easy to find and users can access it without a hassle. Make sure that it’s visually appealing, beautiful, easy to use, and straight to the point. Also, keep in mind the order that you are displaying the items in, and make sure to try different layouts and formations and experiment with which items to focus on and push to your users and go with what works for you. Create visuals or icons for each in-app purchase that will be displayed in your in-app store that will appeal to your users. The icons don’t have to look exactly like what the item will look like in the game but it’s important that the user know what to expect once they make that purchase, not to feel cheated with what they end up receiving. Also having the users visualize what they’re buying can help them make that purchase faster, especially for purchases that might not be represented by actual items inside the game (e.g. character’s strength, intelligence, etc.). You can also use visuals to trick users into buying higher priced items (e.g. representing 10 coins with a single coin visual, 25 coins with two coins, and 50 coins with a big bag full of coins). Color psychology is essential when designing your in-app purchases and store as different colors help convey different emotions to the users. Different colors help you achieve different objectives that can help you through your users’ purchasing journey like grabbing their attention, creating a sense of urgency, and even pushing them to a call to action. Now pricing can be tricky because the goal is to find that pricing point doesn’t necessarily guarantee you the highest number of sales but the highest return in terms of revenue. So you need to make sure that its the optimum price that on one hand will get you the highest revenue and at the same time it’s not too high that it would discourage the users from buying it. You will have to experiment with your price points and see what works best for you. A great way to do that is through A/B testing, where you show different prices to different sets of users, compare the conversion rates for each, and select the pricing point that not only yielded the highest conversion rate but would get you the highest earnings. It was always believed that the smaller purchases priced between $0.99 to $1.99 would be generating the highest revenue as they would appeal to more users for being cheaper. However, a study by W3i found that those smaller purchases contribute to an average of only 6% of the total app revenue while bigger ones priced between $9.99 and $19.99 contribute to an average of 47% of the total app revenue in mobile games. That doesn’t mean that you should increase your prices or only offer big purchases in your app but you need to create bigger and higher priced purchases for your users who are willing to pay more. That way you’ll be having a lot of users buying the cheap purchases but on the long run, you’ll be making more money from the expensive one. Create different variations of your items in terms of quantities (e.g. 10 coins, 100 coins, 1000 coins, etc.) where the more the user buys, the cheaper the individual item becomes, giving them a better value for money and encouraging them to buy more. You can also entice them to spend more by offering bonuses or free items on purchase of higher quantities. Another great strategy similar to the previous one is offering bundles where each bundle is a collection of different items that you can buy collectively at a cheaper rate than what you would normally pay for each of the items individually. It’s also preferred if you can bundle items that go along together. You can also bundle the most purchased items with less performing ones to have your users give them a try and maybe push them to purchase those items later on. A predictably irrational pricing strategy is a term coined by author Dan Ariely in his book “Predictably Irrational: The Hidden Forces That Shape Our Decision” where he did an experiment on 100 students based on an old subscription model of The Economist magazine, asking them if they’d get a web subscription for $59, a print subscription for $125, or a web and print subscription for $125. Needless to say, no one went for the second option, as it was priced the same as the third one but offered less, while 84 students went with the third option, and only 16 students went with the first one, earning him a total revenue of $11,444. He then removed the second option, only keeping two options of a web subscription for $59 or a web and print subscription for $125. In that case, 68 students went for the first option and 32 students went for the second one, making him a total revenue of $8,012 (a 30% decline in revenue). Which is why it’s suggested that you create decoy items, where the main objective of those items isn’t sales per se, but to trick users to spend more by making them think that purchasing higher priced items would be a better deal compared to those decoy items (e.g. offering 10 coins for $5, 25 coins for $9, and 50 coins for $10). Time plays a huge factor when it comes to the users’ purchasing decisions. That’s why you should make sure to deliver the items in the form of purchase recommendations when you feel like they need it the most to increase the chances of them going for it. For instance, if a player can’t pass a level after multiple times, offer them to buy a power-up that would make it easier for them to do so. Limited-time offers are a great way to push your sales. These can be provided in two ways: either a discount on pre-existing items or bundles, or providing limited-edition items that are only available only for a certain period of time. It’s also suggested that you show a countdown timer with the items or offers as it creates a sense of urgency and pushes users to make impulsive purchasing decisions. A lot of successful mobile games like Temple Run or Subway Surfer, where your main goal is to get the highest score you can, offer a “save me” option. The option revives your dead player and lets you continue playing without losing your score. This is a very popular strategy as it tempts users who were challenging their friends or were very close to beating their best score to use it and continue playing without losing their progress. One of the most popular models, especially in mobile games, is adding time-based actions in the game. This forces the player to wait a certain period of time until an action in the game is accomplished and a reward is given or an item is received. However, this can’t be overdone or else the player will be turned off by all the waiting. It also needs to be done in a smart way where you get the player hooked and then introduce a waiting period to complete an action, offering them an in-app purchase option to skip that time. Adding a countdown timer is also recommended for the players to be able to visualize how long they have to wait. Make the waits incremental, where players can wait a small period of time for small rewards and longer ones for bigger, more valuable rewards. Just like how you need loyal users to get better app ratings and reviews, the same applies to in-app purchases. According to a study by Localytics, 44% of app users won’t make an in-app purchase until they’ve interacted at least ten times with the app. 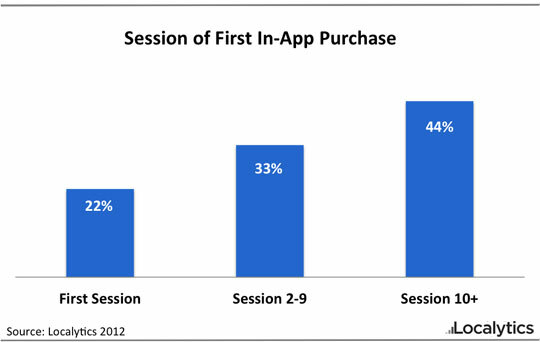 On average, a user who makes an in-app purchase will do so 12 days after first launching the app. This shows that focusing on user retention is of utmost importance as your users are more likely to make their first in-app purchase after using your app for a while, so you need to focus on delivering an amazing experience that will make them stick around and keep coming back. It was also shown in the same Localytics study that the users who wait and interact with an app multiple times before making their first in-app purchase are more valuable in the long run, making 25% more in-app purchases over their lifetime. First session purchasers will make an average of 2.8 purchases in a given app during their user lifetime, compared with 3.5 purchases for all other purchasers. This again shows that while a lot of developers focus on pushing to have the users make an in-app purchase as fast as possible, it might be better to focus on retention and on turning them into loyal users first, as this is proven to have a higher return in the long run and improve the users’ lifetime value. One of the first things you need to do when developing an app is to have an analytics tool to know how well your app is performing, but more importantly to track your users’ behavior. Many tools that provide behavioral analytics can identify users who are inclined to perform in-app purchases sooner rather than later, or on the other hand, those who are prone to never make an in-app purchase without extra incentives. These analytics can be extremely helpful for assisting developers to improve the users’ experiences based on their behavior, identify their loyal users, as well as offer any needed incentives to those users who might need an extra push to make a purchase. If your mobile app or game becomes big and popular enough, you can use that to offer real-life merchandise through your app. This had been the case with hit mobile games like Halfbrick’s Fruit Ninja and Jetpack Joyride that sell t-shirts and mugs through their games and Rovio’s Angry Birds that sells t-shirts, hats, toys, LEGO sets, backpacks, and more, and even went on to make an animated series and a full feature movie. Users are more likely to buy something that they’ve already tried and have proven to be useful for them, which is why it’s better to offer your users samples of your in-app purchases from the get-go. So if your game has power-ups, for example, make the players start off with a few of them so that they can try them out to prove their worth and then when they’re out, go buy some more. A great way to entice your users is to have them sample your in-app purchases, if possible before they buy it. This lets the users get a taste of what they can experience and eliminate any doubts that they might have about their purchase being a waste of money. For example, many photo-editing apps offer free filters as well as paid ones. Users are able to try the paid filters to see how their pictures would look like using them, but they aren’t able to actually use the filter and save the picture without buying it. Another way is a combination of offering samples and having people try your in-app purchases to entice them to buy it. This is to offer some of them as rewards every now and then whenever the player does a task or reaches an accomplishment. This method will help you not only entice your users with in-app purchases, but it will help you get them hooked to the app by having them stay longer in the app to get to that point, increasing their chances of becoming a loyal user. If you have a mobile game, it’s always best that you start the game easy and then increase the difficulty incrementally. Again, this helps get your players attached to the game at first and let them fall in love with it as they progress quickly in the beginning. Then once the difficulty is turned up a few notches, they’ll be challenged, which will motivate them to keep going without being turned off by how hard the game is from the very beginning. They might even start considering in-app purchases to help them get through the game a little bit easier or faster. Set up a model of daily gifts where every day the user opens the app, they get a gift, and the more consecutive days they use the app, the higher the gift’s value, leading up to in-app purchases when they’ll have been using the app every day for a long time. This has two benefits. First of all, it entices the user to use the app every single day, increasing the user’s chances of becoming a loyal user of the app. Second, it entices them to buy an in-app purchase every time they use the app for a specific period of time. Later on, after they’ve bought in-app purchases multiple times and tried them, the chances of them wanting to buy the items without having to wait for them increases. If some of your in-app purchases aren’t available to the user yet and they need to reach some kind of achievement to be able to unlock and buy them or if the items are under development and will be coming to the store soon, it is best to display them as silhouettes or in some way that the player can’t see them clearly. This has been proven to increase their desirability and help motivate users to buy them once they’re available or become unlocked. According to Statista, the App Store raked in an estimated 29 billion US dollars in revenue in 2016, with games contributing a huge share made through paid downloads and in-app purchases. So it only made sense for Apple to make them a focus and help developers promote them. In the Apple App Store, you can now customize in-app purchases by adding display names, descriptions, and promotional images for each. Another thing is subscriptions, which is a set amount of money paid on a regular basis (weekly, monthly, or annually) for additional features, privileges, or even to use the app ad-free. They are also now treated differently than in-app purchases and are split into two separate sections on the product page. In-app purchases can also now appear in search results, the Games and Apps tabs, or even featured on the “Today” page. With the iOS 11 App Store changes, you can also promote up to 20 of them on your product page that users can browse and buy even before downloading the app. 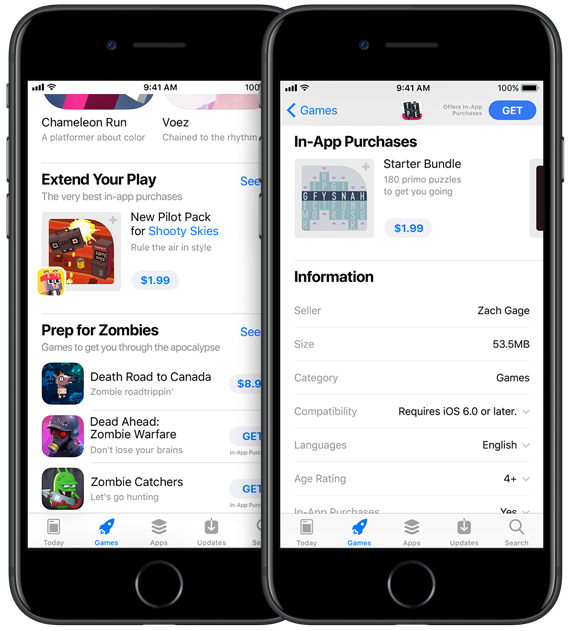 Promoted in-app purchases appear on your product page, can be displayed in search results, and may be featured on the Today, Games, and Apps tabs, increasing your chances of discoverability. This could also be used to push any specific in-app purchases that you want to feature or promote that have discounts or limited offers at the time. Again, every developer’s end-goal is to earn revenue from their app, and the higher the revenue the better, of course. That’s why some might get carried away and push as many in-app purchases and subscriptions on their users as they can, trying to force them to make a purchase or showing way too many ads to nudge the user to pay to remove them. However, this isn’t the best case. Making purchase recommendations to your users is great, but should happen in moderation. Being too pushy and trying to force your users into buying something can have a reverse effect and will turn off the users from using the app altogether. So be smart about when to push your products and don’t overdo it. In December 2016, Nintendo released its first game on iOS, Super Mario Run. It was free to download but only allowed players to play the first three levels for free, after which it asks for a $10 in-app purchase that unlocks the rest of the game with all the other levels. Even though the game was downloaded 37 million times and raked in $14 million in revenue in the first three days (insane compared to industry standards), the game was confronted with a huge backlash over multiple concerns, the main one being that the game forces its users to make an in-app purchase at a high price point just to be able to play it, which ended up reducing the company’s value by $2 billion, dragging down its share price by about 5%. The lesson here is that in-app purchases should always complement the mobile app or game, but they should NEVER be a necessity. Even if you provide in-app purchases in the form of more access to content or subscriptions, you should have a fair share of free content in parallel that the user can access and enjoy, then maybe make a purchase based on that. Mobile in-app purchases can be a great source of revenue for apps and games and it can even be the app’s main source of revenue. However, you need to plan ahead to make the most of this goldmine. You need to create appealing products that complement a great application, grow your user base and loyalty before pushing them to make a purchase without disrupting their experience, as well as be smart about when to push in-app purchases using behavioral analytics and aim to only push them when it’s highly probable that it would lead to a sale. You should also always keep an eye on top-grossing apps. Examine what they’re doing and the models they use, as they’re always changing. You’ll start noticing patterns and strategies across those apps that you can apply to yours to maximize your mobile app monetization.